With this i30 Fastback N, Hyundai broadens the reach of its 'N' performance sub-brand. It's the kind of car you might not expect from this Korean maker, with a 275PS power output intended to provide performance to embarrass German rivals. 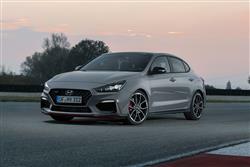 Hyundai continues to be serious about performance. Hence the decision to add this stylish Fastback body style to the i30 N range of high performance models. 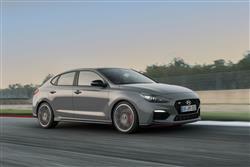 As with the hatch version, it was developed by a team led by former BMW M Power boss Albert Biermann. And it's undergone a lengthy testing period at the legendary Nurburgring Nordschleife racetrack. Also like the hatch, it aims to slot right in amongst the established players in the volume part of the family hatch-sized GTI segment. 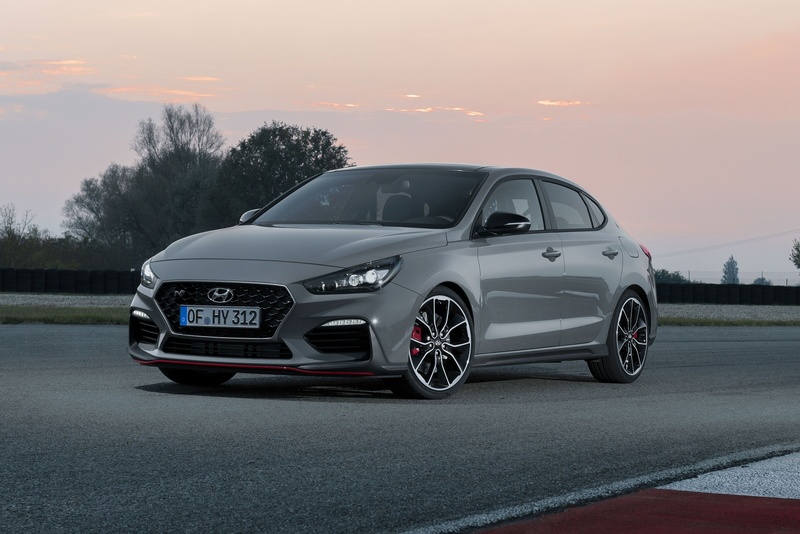 The 'N' in the model name stands not only for 'Nurburgring' but also for 'Namyang', Hyundai's vast research and development centre back in South Korea. So, what's it like beneath the bonnet? 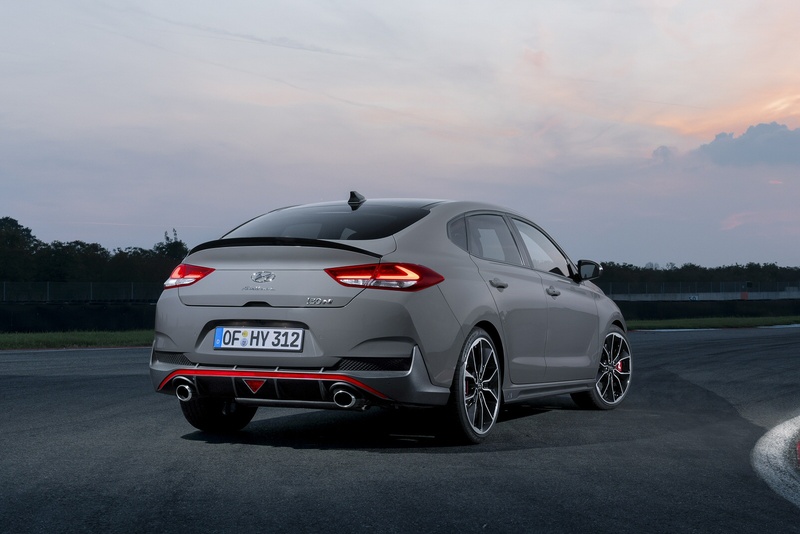 Well forget everything you know about Hyundai because none of that's relevant here: this hot hatch has been developed by people who seriously love their cars. What's different here over an ordinary i30 fastback? Well, the brakes are beefier, camber stiffness is up and the Pirelli P Zero tyres are of a unique compound. Yes, the 275PS 2.0-litre GDI engine is derived from a unit that Hyundai's had on its books for some time, but it's been embellished with a new turbo and a new intake manifold. Getting the idea? No expense has been spared here as part of a development regime on a different level to that of most like-minded rivals. 62mph from rest occupies just 6.1s and the car is equipped with an 'N Grin Control' system which allows drivers to choose from five different drive modes. The settings can be selected via dedicated buttons on the steering wheel: Eco, Normal, Sport, N and N Custom. Depending on the driver's mood, the different modes change the vehicle's character. The i30 Fastback N certainly talks the talk in terms of its looks. At the front, the headlamps have black bezels and the 'Cascading' grille has a red insert. There's a front splitter and a prominent rear wing spoiler for extra downforce and aero-balance. Air inlets have been added to each corner of the car's front end, aiding aerodynamics and brake cooling. The larger wheel arches house 19-inch wheels with a lowered ride height. Inside, you get an exclusive blue-stitched 'N' steering wheel to the left of which is the drive mode selection system. To the right of the wheel, there's a chequered flag 'N' button for the 'N-mode' that releases this car most focused red mist performance setting. The red zone of the variable LED rev-counter changes according to the driving performance and varies with the engine's oil temperature. The 'ball-type' gearknob bears the N-badge. 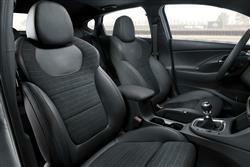 There are high-performance 'N'-embossed sport seats trimmed in a combination of suede and leather or cloth. These chairs feature extendable cushions. Pricing for the i30 Fastback N starts at just over £30,000 for the 275PS Performance model, the only variant being imported. 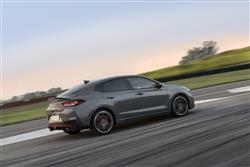 The 'Performance Package' comes with 19-inch Pirelli P-Zero high-performance Hyundai N tyres, distinctive red N break callipers and larger brake discs (18-inch at the front, 17-inch at the rear). An 'E-LSD' Electronic Limited Slip Differential and a Variable Exhaust Valve System are additional features included in the Performance Package to provide the optimal race track experience. As standard, buyers get an 8.0-inch centre-dash monitor which shows navigation instructions and features information on PS, torque and turbo boost, as well as a lap and acceleration timer. 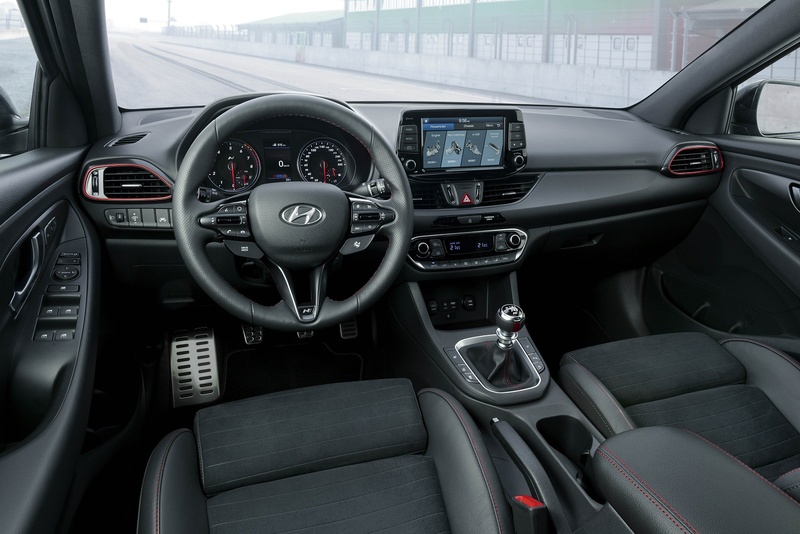 All the infotainment options include access to the 'Apple CarPlay' and 'Android Auto' 'phone mirroring systems, enabling users to connect their devices to deliver and control music, telephone or navigation functions on-screen. Standard camera-driven safety features include 'AEB' 'Autonomous Emergency Braking', 'DAA' 'Driver Attention Alert', an 'LKAS' 'Lane Keeping Assist System', an 'SLIF' ' Speed Limit Information Function' and 'HBA' 'High Beam Assist'. The introduction of new engine technology has kept Hyundai right on the pace of the class best when it comes to efficiency and carbon dioxide emissions. The brand says that this 2.0 T-GDI petrol model will return combined cycle and CO2 returns that are very competitive with obvious rivals (read VW Golf GTI). For that, a combined cycle return of around 45mpg and a CO2 reading of around 150g/km will be necessary. What else might you need to know? As ever with Hyundai, a strong buying incentive is the five year unlimited mileage warranty that comes as standard. It's backed up by breakdown cover that last the same length of time and free annual vehicle health checks over this duration. True, rival brand Kia claims to better this package by offering a similar seven year deal, but there, you're limited to 100,000 miles. As for servicing, well your i30 N will need a garage visit once a year or every 10,000 miles, whichever comes sooner. If you want to budget ahead for routine maintenance, there are various 'Hyundai Sense' packages that offer fixed-price servicing over two, three or five-year periods. You can pay for your plan monthly and add MoTs into the three or five year plans for an extra fee. If you�re looking for a new Hyundai i30 Fastback 2.0T GDI N Performance 5dr Petrol Hatchback for sale, you�ve come to the right place. At Bristol Street Motors we don�t just have the best Hyundai i30 Fastback 2.0T GDI N Performance 5dr Petrol Hatchback deals, we also offer friendly advice and help with all your enquiries to ensure your buying experience is a happy experience.